Dalfo, C.; Fiol, M.; López, N.
Mixed graphs can be seen as digraphs that have both arcs and edges (or digons, that is, two opposite arcs). In this paper, we consider the case where such graphs are bipartite. As main results, we show that in this context the Moore-like bound is attained in the case of diameter k = 3, and that bipartite mixed graphs of diameter k = 4 do not exist Mixed graphs can be seen as digraphs that have both arcs and edges (or digons, that is, two opposite arcs). In this paper, we consider the case where such graphs are bipartite. As main results, we show that in this context the Moore-like bound is attained in the case of diameter k = 3, and that bipartite mixed graphs of diameter k ≥ 4 do not exist. 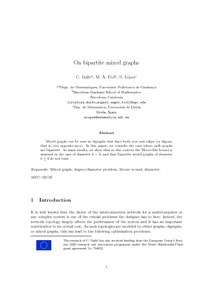 Dalfo, C., Fiol, M., López, N. On bipartite-mixed graphs. "Journal of graph theory", 24 Abril 2018, p. 1-9.